Harold W. Hoehner, Ph.D. is Professor of New Testament at Dallas Theological Seminary and is well known for his work on biblical chronology in the first century. He is also the author of a commentary on Ephesians in the Baker Exegetical Commentary series. Philip W. Comfort, D. Litt. et Phil., is senior editor of Bible reference at Tyndale House Publishers and adjunct professor of Religion at Coastal Carolina University. His works include Early Manuscripts & Modern Translations of the New Testament, The Text of the Earliest New Testament Greek Manuscripts, and Encountering the Manuscripts. He has authored two commentaries on John and three volumes of poetry. 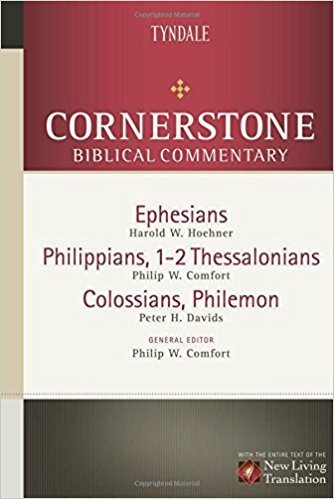 He serves as the coordinating New Testament editor for the New Living Translation, and he is the General Editor for the Cornerstone Biblical Commentary series. Peter Davids, Ph.D. is a Professor of Biblical Theology at Stephen's University. He served as a missionary educator in Europe, training Christian leaders in the German-speaking world, and has written commentaries on James and 1 Peter. He is also co-editor (with Ralph Martin) of The Dictionary of the Later New Testament and Its Development.